Sprengeri Asparagus Fern is a fern that works great as a green filler for hanging baskets or containers. It will grow from 8" to 12" high and 16" to 20" wide. Plant in partial sun as full sun will burn the foliage. This fern gives you a feathery or airy look with the foliage. Water regularly for best performance. 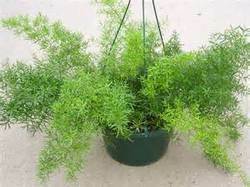 If you wish to plant Sprengeri Asparagus Fern as a houseplant, select 5 plants and plant in a hanging basket or container. It will fill in fairly rapidly.